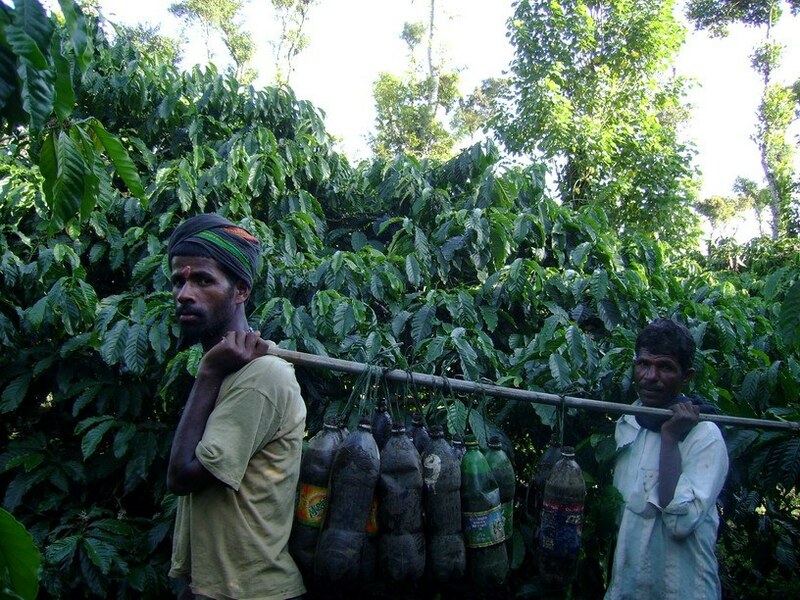 In recent years the productivity inside shade grown ecofriendly coffee plantation is on the decline. The reasons are many. Most coffee farmers point out an accusing finger to this drastic reduction in yields per hectare due to global warming. These combined factors has made coffee farming not only an unremunerative form of livelihood but has also led to neglect of coffee farms. In many places the forest cover has declined by over 50 % leading to a severe loss of biomass accumulation on the floor of the forest. Less biomass translates into more runoff and soils become vulnerable to erosion. This has resulted in the soil being exposed to high daytime temperatures killing most of the beneficial microbes. In order to offset this loss in soil fertility, farmers are pumping in indiscriminate amounts of chemicals and fertilizers to push up yield levels. In reality, the pressure on the soil is increasing, leading to reduced soil productivity. These high powered chemicals has already made their way inside the soil system and in many instances altered the chemical equilibrium beyond a point of repair. These toxic chemicals have also entered food chains and are now destroying food webs. In certain cases the damage is irreversible and irreparable. The delicate balance governing various biotic partners inside the coffee forests is at great risk. However, our work on soil micro flora for the past twenty years provides a cost effective technology to the farming community in building up a sustainable and healthy soil system. The most important thumb rule that all farmers should understand is that no soil will support vigorous plant life unless it is teeming with the billions of microbes that are necessary for maintaining soil health. The primary objective of writing this article is to inform and enlighten the coffee farming community worldwide in understanding the interplay of the highly complex and non linear natural processes occurring within the confines of the coffee forests and how one could exploit the billions of microbes in improving the qualitative and quantitative aspect of shade coffee. We have worked with coffee forest ecology for the past two decades and from time to time devoted our energies in discovering ecofriendly technologies. The technology described below involving the Stimulation of soil micro flora is 100 per cent indigenous, environmentally friendly and a technology which has very low costs. 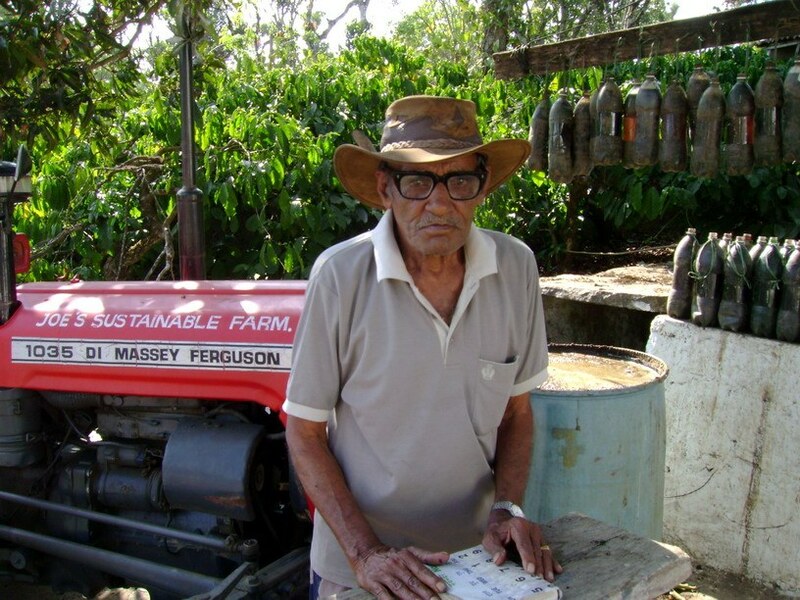 Improving soil health is the most important priority inside shade grown coffee farms. In simple terms it translates to the restoration of soil organic carbon as one of the principal vehicles in improving the fertility status of the soil by the increased activity of microorganisms. The basic raw material needed for microbes, namely biomass, is already available insitu and only needs to be acted upon by microbes to convert the same into energy rich compounds beneficial to all components of the coffee forest. Even though we have not fully worked out the relationship among and between different groups of microorganisms, our work clearly establishes the fact that the stimulation of microorganisms with the help of suitable raw materials available on the farm itself, will lead to increased organic matter decomposition. Imparts resilience to the soil system. The soil is better protected to fight pathogens. Increases naturally occurring organic acids that stimulate root hairs. Enhances the water retention capacity of soils in the summer months. Pick 200 liters capacity drum and place it in a shaded area. Add 20 Kgs of fresh cattle dung. 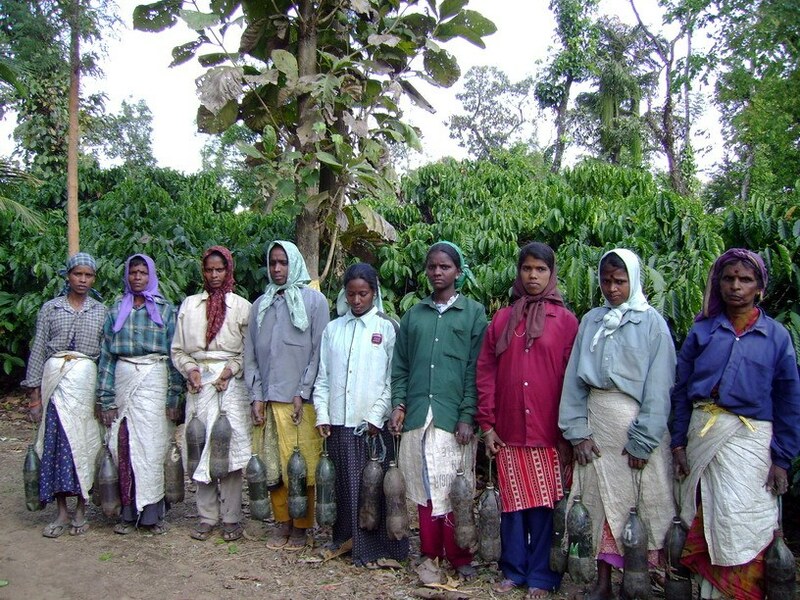 In the morning after the roll call, each worker should carry two bottles to the work place and empty it inside the trenches (neergundi or thotalgundi). 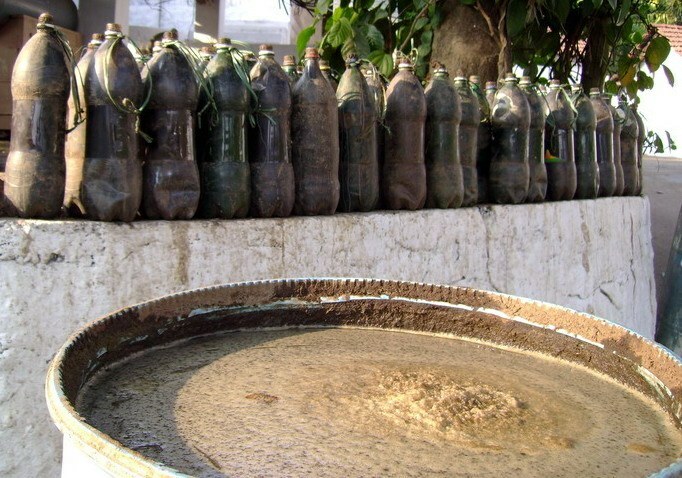 Once the work is over, the bottles should return to the original place and a person should be given the responsibility to fill it up and keep it ready for the next day. We have carried out experiments for over 5 years on the effect of human urine on the growth and development of the coffee bush. 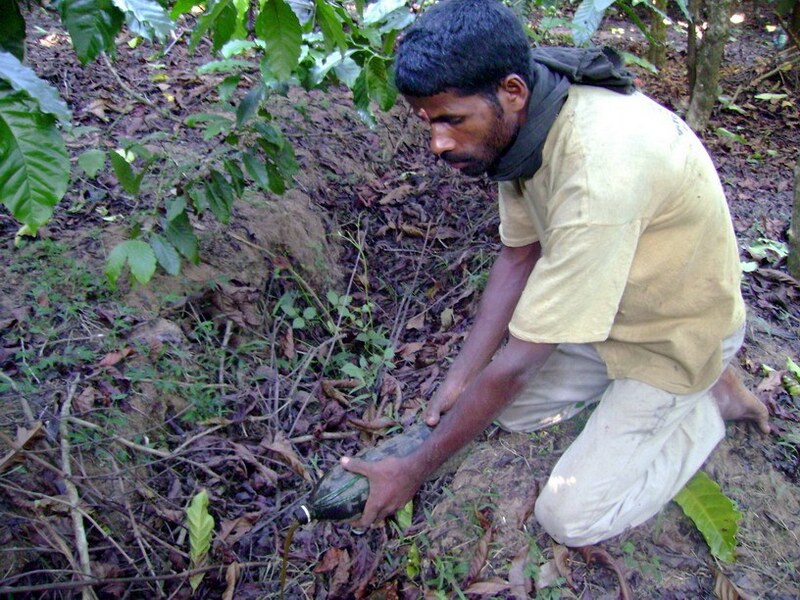 A one acre coffee block comprising of 300 plants was selected. After the application of compost the block was subjected to urine application at the rate of half a liter per plant. The same procedure was followed as described in Method-2, except that human urine was replaced with cattle urine. 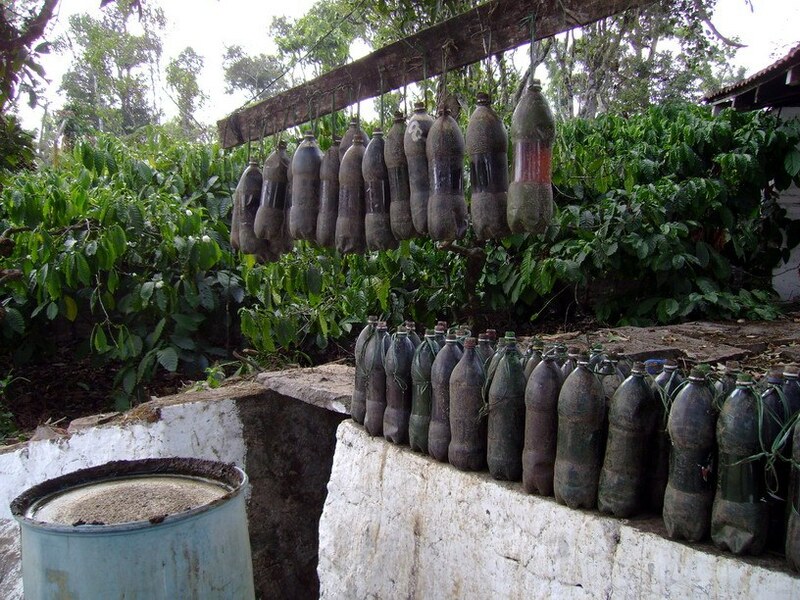 The selected block (one acre, 300 plants) was treated with half a liter of cattle urine per plant. Urea, uric acid, Minerals, nitrogen, Sulphur, Ammonia, copper, Iron, Phosphate, Sodium, Potassium, Manganese, Carbolic acid, Calcium, salts, Vitamin A,B,C,D,E, Lactose sugars, Enzymes, Hippuric acid and creatinine. 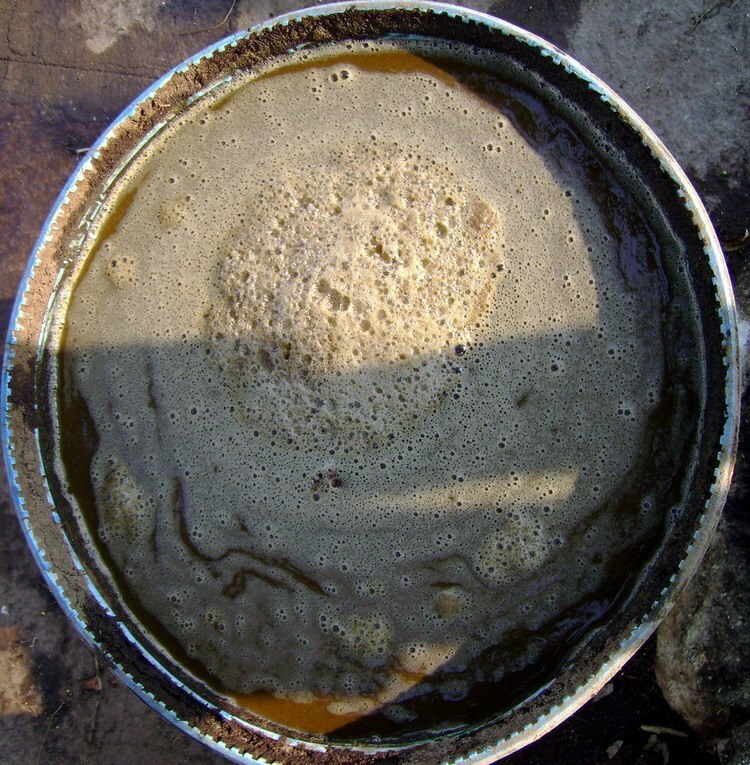 Our observations point out to the fact that application of the organic soup, human urine and cattle urine resulted in the build of the primary and secondary micro flora, responsible for decomposition and release of locked up enery in the accumulated biomass. Even though there was no significant increase in yields compared to other blocks which received regular doze of compost, the yields were STABLE over a 5 year period… We also observed that the bearing wood had seven to eight nodes and the bean clusters were close to one another. The size of the berries was uniform. The addition of the organic soup acts as a catalyst for various groups of microorganisms to act on the available raw material. Coffee farmers and Planters need to understand that inside shade grown ecofriendly coffee plantations, it is not the raw material that is in short supply, but the initial stimulant in the form of the booster doze , namely the well balanced organic soup . This STIMULANT brings about a rapid succession and transformation of the available raw material. Immediately after adding the organic soup the microbes respond in four ways. Microorganisms FEED on the organic soup resulting in the buildup of both Primary and secondary decomposers. The microorganisms preferentially stimulated by the addition of the organic soup make up the primary flora. Over a relatively short period of time, the secondary flora also develops, one growing on compounds produced by the primary group of microorganisms growing on the dead or the living cells of the initial flora. This succeeding group of microorganisms has an altogether different biochemical make up from those appearing initially. The soil micro flora and soil fauna break down the biomass, converting organically held nutrients into mineral forms available for renewed plant uptake. The energy balances help in bringing about a stable soil ecosystem which can to a large extent combat global warming and wide variations in environmental conditions. The micro flora recycles the nutrients and assimilates organic wastes resulting in humus formation. As a byproduct of their metabolism, microorganisms synthesize new organic compounds, many of which are known to stabilize soil structures. 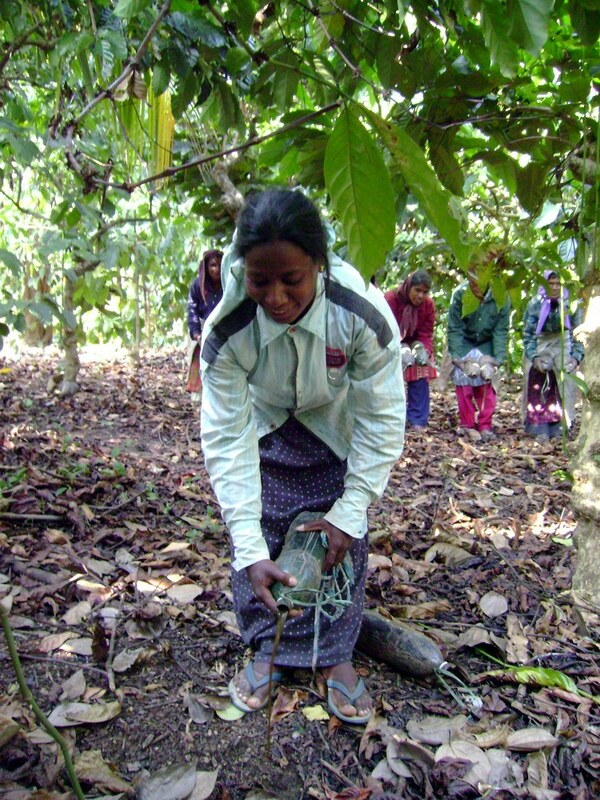 Shade grown coffee forest soils support not only coffee but a host of other biotic partners. The strength of these soils is due to the microbial factor which nurtures the self sustaining pyramid. But for the activity of microbes in transforming and releasing energy to the coffee ecosystem, the entire system would collapse. The time has come to intelligently reshape the face of the coffee forests to create favorable conditions for the billions of microbes to work in our favor. Chemical intensive farming is not the answer to build up a strong and resilient ecosystem. If strong measures are not taken to discourage the use of chemical poisons (synthetic fertilizers, chemicals, weedicides and pesticides), it will not only result in the breakdown of energy flows, but will also signal an end to ecofriendly coffee. Chemical poisons often inhibit the growth of soil microbes. It also creates long term disturbances in the ecological populations of different species. In few places the damage inside shade grown ecofriendly plantations is due to the introduction of modern agricultural practices, accompanied by the loss of local knowledge systems and an increasing dependency on readymade fertilizer and chemicals. We keep reminding the farming community that, the mindset is the main barrier in adopting the cost effective technology described in this article. The trick lies in cautiously and consciously adopting different measures of sustainable development and strive for a new paradigm of individual and environment friendly technologies. In the coming years the traditional role played by microbes in supporting coffee ecosystems should not go unrecognized. Anand Titus Pereira & Gowda. T.K.S. 1991. Occurrence and distribution of hydrogen dependent chemolithotrophic nitrogen fixing bacteria in the endorhizosphere of wetland rice varieties grown under different Agro climatic Regions of Karnataka. (Eds. Dutta. S. K. and Charles Sloger. U.S.A.) In Biological Nitrogen Fixation Associated with Rice production. Oxford and I.B.H. Publishing. Co. Pvt. Ltd. India. Booker, Karen. 2000. Fertilizers and Soil Amendments: It’s Tricky Business. Erosion Control Feature Article, September/October. Martin Alexander. 1978. Introduction to soil microbiology. Second edition. Wiley Easter Limited. New Delhi. Wright, S. F. 2003. The importance of soil microorganisms in aggregate stability. Proc. North Central Extension-Industry Soil Fertility Conference. 19:93-98.